NEW YORK (CNNMoney.com) -- Of all the flash points in the debate over Social Security, few generate as much heat as raising the retirement age. It's time to lay bare the arguments. Today, the so-called normal or full retirement age is 66, up from 65 a decade ago. It is scheduled to increase by two months a year starting in 2017 until it reaches 67 in 2022. Meanwhile, 62 remains the age at which those who retire early can collect a percentage of their full benefits. Many budget and debt experts recommend that the retirement age be raised further. Why? Because Americans are living longer and spending more years in retirement than they did when Social Security was established. "The full retirement age would have to increase to 73 for adults to have the same expected years of remaining life in retirement today as in 1940," Urban Institute senior research associate Melissa Favreault and senior fellow Richard Johnson note in their research. Most proposals being discussed would raise the full retirement age to 68, 69 or 70. Some would also increase the early-retirement age. Why do some say it's a bad idea? Opponents of increasing the age contend, among other things, that while people are living longer, they are also working longer, producing more and paying more into Social Security than earlier generations. "When you look at the big picture, what really matters is how much we pay into the system, not whether we're living longer," said Monique Morrissey, an economist at the Economic Policy Institute, in a report that contends that raising the retirement age is not the best solution. In addition, they say, a retirement age hike would unfairly hurt workers in physically demanding jobs, those in poor health or in low-income groups whose life expectancy hasn't gone up much. Many people over 65 would also be hurt, they say, since age discrimination can make it hard for seniors to secure jobs. Proponents of raising the retirement age agree: Some people will get hurt. "It's wishful thinking to assume that we could raise the retirement age and protect everyone," Johnson said. But they believe that shouldn't prevent policymakers from putting the program on a more sound footing so long as steps are taken to protect groups who would be hurt by an increase. They also note that the percentage of those workers has fallen in the past few decades as Americans in their 50s and 60s have become healthier, better educated and less likely to be in physically demanding jobs. "Why have the tail wagging the dog?" said pension expert Ron Gebhardtsbauer, who sits on the board of the American Academy of Actuaries and runs Penn State's actuarial science program. Those who would be unduly disadvantaged by a higher retirement age can be compensated in other ways, proponents say. Specifically, access to disability and Supplemental Security Income benefits could be expanded. Or low-income workers could be exempted from an increase in the early retirement age. As for older workers' job prospects, it's true they have a hard time finding work today. But changes to the retirement age would affect people who retire many years from now. How much would it save? 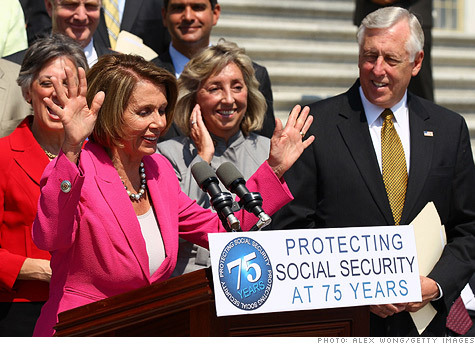 Raising the retirement age could help keep Social Security solvent for decades to come. The question is how much. The answer: It depends on how the change is structured. For example, an increase to 68 for today's 44-year olds (those turning 62 in 2028) "would not significantly extend the trust fund exhaustion date," according to the Congressional Budget Office. If, however, the retirement age rose to 68 for today's 50-year-olds (those turning 62 in 2022), that would reduce the program's 75-year funding gap by 29%, according to estimates from Social Security's actuaries. Of course, any efforts to protect groups unfairly disadvantaged by an increased retirement age would reduce those savings. In any case, a retirement age change would likely be part of a larger package of reforms to the program. How would it affect benefits? Opponents of raising the retirement age say it amounts to an across-the-board cut in benefits. That is generally true if workers leave the workforce before the full retirement age. For example, if a future retiree works an extra year for every year the retirement age is increased, "he should be getting roughly the same amount of retirement security," said Frank Todisco, a senior pension fellow at the American Academy of Actuaries. Say a worker born in 1980 plans to retire at 67 and then the retirement age is raised to 68. If he logs one more year on the job, he should get Social Security benefits roughly equivalent to what he'd get under the current system. But if he retires at 67 anyway, "then he'd get less under the new system than the current one," Todisco said. Are you smarter than a budget wonk? Take the CNNMoney deficit quiz. When will you get to retire?